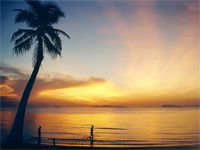 The island is Thailand's third largest, measuring 21 kilometres at its widest point and 25 kilometres in length. It is one of a group of 80 tropical islands, most of them deserted. A mountain ridge runs across Koh Samui from east to west and most of the interior is forested hills. The rich hues of wild vegetation are seen throughout, interspersed with the contrasting greens of coconut palms and emerald paddy fields. 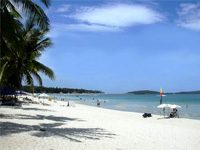 The largest and most popular beaches on Samui are Chaweng, Lamai, Bophut and Maenam. But for those looking for a quieter place to spend their holiday or business trip, there are another 20 or so beaches to choose from. As for activities, there is something for everyone. Sun worshippers and Watersports enthusiasts will be in heaven on Chaweng beach, whilst culture fans and nature lovers can fill their time visiting temples, trekking in the jungle or learning Thai arts such as cooking and massage. The easiest and fastest way to reach Koh Samui is by air from Bangkok, Phuket or Singapore with Bangkok Airways, the only airline to serve Koh Samui. On arrival, you will find out why Samui airport ranks as one of the most beautiful in Asia and beyond. Its tropically planted gardens burst forth with flowering glory and greenery all year round, whilst the terminal buildings consist mainly of traditional wooden structures. There is no mistaking that you've just arrived in a tropical paradise. A 50-kilometre ring road skirts Samui's coastline, giving ready access to all of the beaches and the modest administrative centre of Nathon, with its beachside huddle of houses, shops and restaurants. It takes a good hour to drive around the island, not counting the many stops you'll want make at the beautiful beaches or sojourns along the inviting tracks that lead into the island's jungle interior (be aware that all of the rough trails crossing the mountainous interior are strictly 4WD or dirt bike trails). A 50-kilometre ring road skirts Samui's coastline, giving ready access to all of the beaches and the modest administrative centre of Nathon, with its beachside huddle of houses, shops and restaurants. It takes a good hour to drive around the island, not counting the many stops you'll want make at the beautiful beaches or sojourns along the inviting tracks that lead into the island's jungle interior (be aware that all of the rough trails crossing the mountainous interior are strictly 4WD or dirt bike trails).